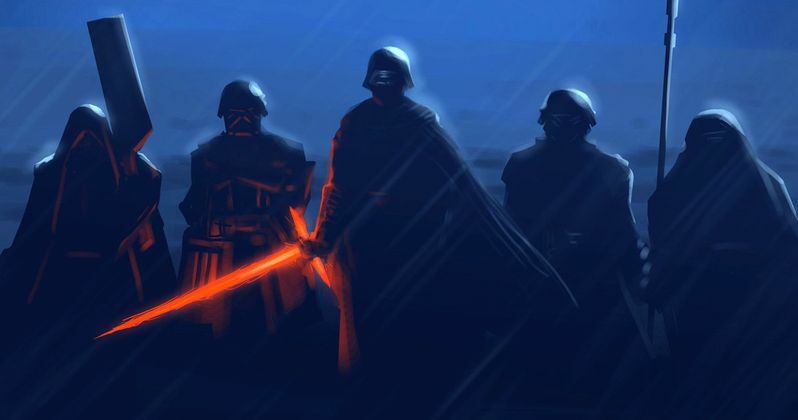 Knights of Ren Origin Revealed in Star Wars: The Last Jedi? Could Darth Vader's Castle on Mustafar make a return to the big screen in Star Wars: The Last Jedi? That's the gist of the latest rumor, and it's one that has been brought up quite often in the wake of Rogue One's release in theaters this past December. The castle is believed to be the one thing that connects Star Wars 8 and the first anthology movie together. Today, we may have a better understanding of its importance not only to the movie, but also to Kylo Ren's team of Jedi Assassins known as the Knights of Ren. The Knights of Ren remain a complete mystery. While they were introduced in The Force Awakens, not much was said about them. And their name is never spoken on screen. If it weren't for J.J. Abrams talking about the Knights in the press leading up to The Force Awakens release in theaters over a year ago, we may not even know who they are. Star Wars: The Last Jedi is now less than a year out, and it seems some of the mystery is being cracked. There have been plenty of fan theories leading up to this minute. And some of that falls in line with what we're hearing today. And the Knights of Ren origins will help peel the layers back on Kylo Ren's own backstory. It has long been known that The Force Awakens trilogy will be as much about Rey's path to becoming a hero (or possibly villain) as it will tell the unlikely tale of Ben Organa (some say Solo, but he's royalty and would have taken his mother's Maiden name not that of a scoundrel like Han Solo). On the Blu-ray commentary that was recently released with the Star Wars: The Force Awakens special edition, J.J. Abrams revealed that most, if not all, of Kylo Ren's path to the dark side and possible redemption is completely laid out. Most of Kylo's history wasn't revealed in the first new Star Wars movie in over thirty years so that it could be told in The Last Jedi, which is one of the reasons the lettering in the recently revealed title card is red. These new plot details come from a somewhat trusted Youtube source who trades in Star Wars 8 rumors. Before the New Year, Mike Zeroh, who claims to have insider knowledge from the set, revealed that Rey will be losing her hand much like Luke Skywalker in The Empire Strikes Back. He now claims that there will be a very important flashback to a castle in the eighth Skywalker saga chapter. And many are speculating that this will be Darth Vader's castle from Rogue One. The Last Jedi will be flashback heavy, something we've heard before. Previous reports claim Luke will channel the force from what is known as a 'force rock' to show Rey the history of how he lost Kylo Ren to the Dark Side, so that she better understands the path Ben Organa was set on. The heavy emphases here is not only on Ben but Luke's fallen Jedi pupils. Skywalker's lost students (i.e. Padawans) are those who make up the dreaded Knights of Ren. Sensing distress in their Master, Kylo Ren is able to recruit this gang from Luke's Jedi temple and form a dangerous gang of intergalactic assassins. And they follow Ren's dark cause to finish what Darth Vader started, whatever that may be. The Last Jedi will have a flashback that shows the Knights of Ren origin story in full. And it is this scene that involves the castle. This same castle is said to be first revealed in Rey's The Force Awakens flashback, it's just that viewers don't know what they are looking at yet. It comes when she witnesses the Knights of Ren slaughtering a mysterious clan. The backdrop where we first see Luke Skywalker place his hand on R2-D2 in The Force Awakens could definitely be Darth Vader's home world of Mustafar. Which now makes more sense. As many assumed, the castle scene in The Force Awakens is a vision of Kylo Ren killing off the last of Luke's students. Star Wars Story Group chief Pablo Hidalgo actually said a while back that this is not the case. One Twitter user asked, 'The [Force Awakens] script says Kylo kill a warrior in the flashback. Is that scene plays in Luke Academy, or somewhere else?' Hidalgo answered with this, 'Now that the script's out, It's somewhere else. Production identified that warrior as 'clan leader'.' It has been speculated that these can't be Luke's students who are killed, because the group that the Knights slaughter in The Force Awakens look to old to be Jedi Padawan. So, that answer is still up in the air. Who did Kylo and his Knights kill in the Force Awakens flashback? The answer will be unveiled in The Last Jedi. And perhaps it's the answer to who, what and why there is a 'Last Jedi'. What Zeroh wants to make clear is that the castle is definitely spotted somewhere in this scene. Ultimately, it is believed that Kylo Ren and his Knights have infiltrated and taken over Darth Vader's old castle, which begs the question, does it rain on Mustafar? With the flashback scene so important in setting up Rey's story in The Force Awakens, the idea that there will be more 'Forcebacks' as they are often called doesn't seem like an unlikely thing. Neither does making the Knights of Ren be Luke's fallen Padawan, whom Luke Skywalker is rumored to fight in an epic duel to their demise in The Last Jedi.